I am so excited for the New Year to unfold as 2018 was a life-changing year that has led my family and I to living and eating cleaner and healthier and now I am personally finding myself more focused and revving to go than ever before and excited for what 2019 has in store. For 2019 to be a success in all aspects of my life, organization is a must which is where Denise Albright Studios and their Reminder Binder comes in to play. The NEW 2019-2020 Reminder Binder® Planner is the perfect planner for me & my family as it has everything that I need to stay organized all while having fun organizing my days, weeks, months and more with everything that this binder offers. It helps you to stay organized for 18 months and covers January 2019 through June 2020! In this modern, digital age that we live in there is true value in actually writing things down versus the way things are done via technology these days. For me writing things down and planning truly makes a difference in helping me to stay organized as well as motivated in not only achieving my daily routines but also keeping me focused to achieve my goals and keep myself on track when it comes to accomplishing them. The Reminder Binder allows me to do just that… write it down and see it, stylize it with stickers & notes, and of course remember it. What’s even better is that once I have written it down I know that I am ready to go for my day, week, month… and can actually stop thinking about all of my “to-do’s” and live in the present. I find that I am not nearly as stressed and that I am centered, focused and organized which allows me to get everything done each and every day all while spending more time with my family as I am not scattered and running around like a chicken with my head cut off. My family seems to be appreciating this quality time too and I am seriously loving it. Check out this video which is what led me to love the Reminder Binder from Denise Albright. *Hard Cover – for the 10,000 times you flip through it, it’s built to last! *Elastic Band Enclosure – your planner gets packed like your week, this band will help keep it altogether! *Highlight special dates with the 361 stickers provided on (4) full pages. *Use your Stock it Pocket to keep tickets, coupons, postage stamps or greeting cards at your fingertips. *When you need a gift for those special dates, use the Nifty Gifty Checklist to stay on track with your gifting to-do’s! *Flip to the 2019 and 2020 yearly thumbnails for a fabulous overview in a single page spread. *Perpetual style monthly page to jot dates to remember each month…like the birthdate of your new niece or nephew this year! *Use the weekly pages to list daily details…and when the details have details…use the notes section provided on each week. *The 3-month thumbnails make it easy to relate dates in the upcoming weeks. *The weekly pages are color coordinated for your convenience, too. *1-List, 2-List, 3-List…Store! These perforated pages are handy tools for you to jot and trot! Whether it’s the weekly grocery list, a guest list, dinner menus or the movies that you want to see, when you think it, ink it here! *Populate the contacts pages with all the info you need for mailing invitations, sending an e-note or remembering a birthday. *Complete your Personal Information page to ensure a speedy return when someone finds your Reminder Binder! *By design, your Reminder Binder is made to travel…take it with you in your handbag, your diaper bag, gym bag, or in your car! *Bonus keepsake gift box – make a pretty stack on your shelf to refer back to remember all the good times! I am in love with this Mini Monthly Desk Calendar! I was super excited about this one as I knew that it would be the perfect pad to keep at my desk and to help me stay on top of all of my assignments & projects for work, doctors appointments, my kids activities and school assignments, birthdays, holidays and more. It provides me with an overview of each month in a 12-inch wide view and I especially love the desk calendars “take note” section available on every page. This is the ideal way for me to jot the important thoughts and must-do’s for that month, too. This 12X9 padded planning tool is so much more than meets the eye as you can flip through the pages to find holiday lists, a yearly planner, a perpetual-style Dates-to-Remember calendar, a monthly bill pay worksheet, lists with checkboxes on the backside which I love as well as a short stack of weekly planner pages. The Peek at the Week® Planner Pad is the perfect way to get everyone in your household on the same page when it comes to your families plans and commitments for any giveaway day. It seems that this should be an easy thing to do, but with the busy lives that we live today it can be hard to ensure everyone in your household knows what is going on all of the time. This planner is the perfect communication tool that will ensure every member of your family is aware of each days activities and plans. Pretty cool for sure and I have put it on my refrigerator as it is the perfect place for my family to update themselves and get an idea of what any given day holds… including what’s for dinner! In all honesty…. 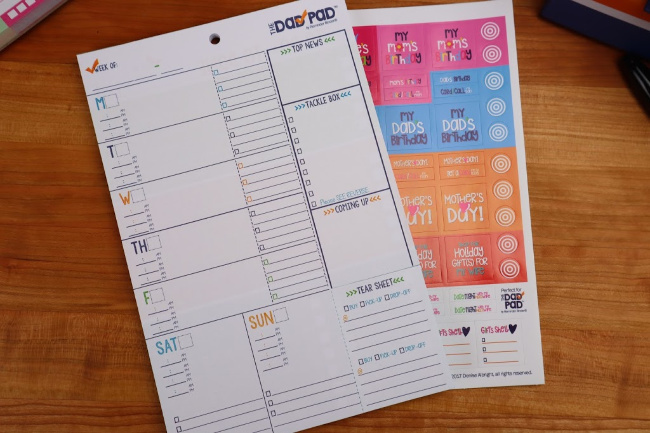 the Dad Pad Weekly Planner Pad is just perfect for both moms and dads but I love that this is a great way to encourage Dad to be a part of the day to day in terms of scheduling and keeping track of all of the to-do’s each and every day. With this planner you can fill-in all the week’s reminders in one-place in writing…just the way most moms or dads need it! I always retain information better when I write it down which is what makes all of the Denise Albright planning and organizational tools so effective and fabulous. The features are amazing with this little planner pad….it has 60 weekly pages, it’s the perfect 6″ x 9″ size pad that is drilled for easy hanging, comes with 322 “man” task stickers that make keeping track and organized fun and attention grabbing, it provides sections for each day, To-Do’s and “Coming up” plus a perforated tear sheet that you can use as a reminder while on the go plus as if that is not already enough… there are handy checklists on the reverse of each and every page. The Dad Pad is the perfect accompaniment to use with the Reminder Binder and a must for every household. These fabulous Planner Stickers are the perfect way to enhance any planner, calendar or pad with these fun hand-illustrated stickers! 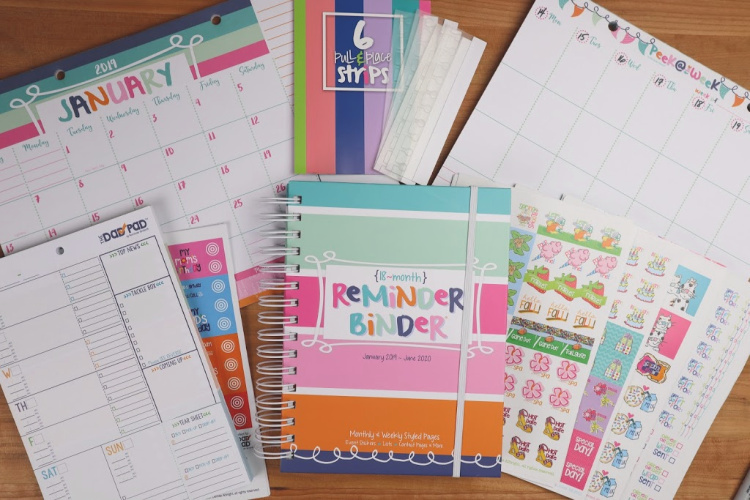 There are many types to choose from and the stickers for me make the planning super fun as well as attention grabbing when I am looking at my planner. I just love them and they are the perfect accompaniment for all of the Denise Albright binders and planner pads. 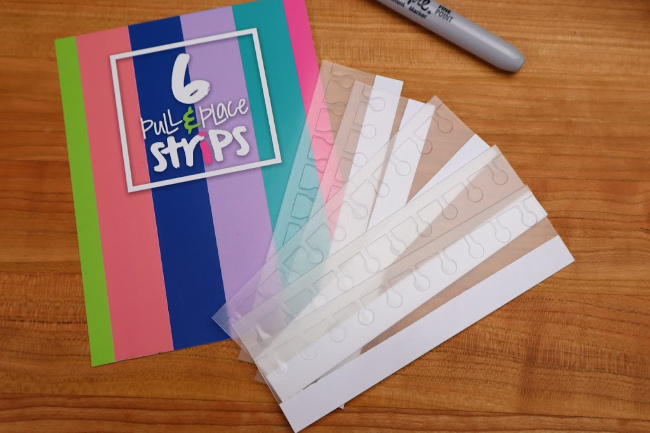 The Pull and Place Adhesive Strips are ingenious and a must have for your Reminder Binder for sure. Whether you need to add in some coupons, flyers, lists, notes, to-do’s or a photo that is special for you that particular week…. the pull and place strips making adding them to your binder a snap. So what do you think of the Reminder Binder from Denise Albright as well as all of the other essential planning tools I picked up? I am in love with all of her fabulous organizational tools as they are super fun to use, really pretty to look at and visualize as everything coordinates perfectly plus her products are made to be amazingly durable as well as extremely effective at helping you to set those goals, make plans and stick to them all while being affordable! Seriously, you can get the Reminder Binder plus additional accessories for the price that you will spend on a binder alone from the other competitors. 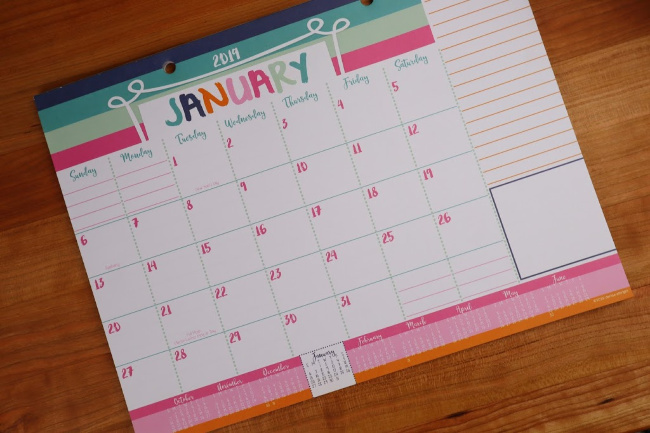 There is no better way to stick to your New Years Resolutions than getting and staying organized via the tools that Denise Albright provides and I highly recommend them. If you are in need of organizing like me and need the perfect planner like I did…then check out Denise Albright and all of her amazing organizational tools today! Use code —>DSAVVY<— and you will save 30% on anything & everything! Check out the Reminder Binder and all of the Denise Albright products for yourself today and get to organizing! Love this planner! Not only does it have eye-appeal, but it has so many options for reminders and I need all the reminders I can get! And the removable tabs that can be attached to the pages ….. brilliant!! I must have this! Just yesterday I missed an appointment I had made last week. This may be just what the doctor ordered! Wow, these look really nice. I’m one of those people who needs to be organized, makes lists, etc., so this really appeals to me. I like these. I love making lists, etc., so I’m a nut for being organized, lol. This is right up my alley. I like the reminder binder, It is so cute. This binder looks incredible! Seriously, I am so disorganized and I absolutely need something like this. Thanks for sharing and doing a review. There are certainly a lot of components in the binder and my New Year’s resolutions include getting more organized! I can see huge benefit to using this product. These are so cute things. It seems to me cheerful for every entry in the planner because the colors are so cheerful. This post has reminded me to start planning for my 2019. I hope it is still not too late. These cute organizers certainly excite me to do it. I love the reminder binder, it’s an organizing masterpiece! I’m a big planner person! I love a good planner. I really like those adhesive strips so you can add invitations and such into the planner!! What an incredibly clever planner. (Get Organized In 2019 With The Reminder Binder & More From @DeniseAlbrightStudio! @SMGurusNetwork #ReminderBinder) I love this planner for my daughter to have. It would really help her keep more organized everyday. I could definitely benefit from more organization in my life. I like this binder planner idea, everything is well thought out. I need everything! I like collecting notepads and all those stuff. What great binder options! I live by my planner but I feel like I can never find the right one for my needs. I’m going to have to check out more of the ones you suggest. Nice planner. This is definitely something that I need to help me organise my blog content plan as well as my tasks at work. This planner/binder looks like the ultimate guide to organization! I also love the dad pad addition, definitely something that would have been a huge help in my home. I’ll be sure to check this out, thanks for sharing! Oh my goodness, this stuff is so cute. I am a planner junky. I have the one I use for my blog stuff, a pocket calendar that I use to keep track of kids/work/appointments/bills, and the wall calendar my family refers to for all that stuff. I need to bookmark this and order this stuff for 2020. My geekiness is quivering! Organizing gets easy with a planner. So life gets easy I love planners! Fun way to keep track of a busy schedule. We have cell phones and iPads that we keep our appointments logged into. We also have a hand written day planner that we always refer to as the one tracking device that will always be accurate. That 2019-2020 Reminder Binder Planner looks terrific! This is the first time I have heard of it but by the looks of it it’s a fabulous way to organize! Thanks for letting me know! I like a huge version of your weekly planner and put it on my wall so to be reminded be everyday. Your new organizer is so adorable and hope you enjoy using it fully. What a great planner! There are so many planners out there and it can be so hard to find a good one. Thank you for giving us a sneak peak! This binder looks amazing! I’m all about finding new ways to be organized! I think the Reminder Binder is the one that would work mostly for me. I also love the adhesive strips and all the lovely stickers. The whole package may be great to keep all of us on schedule. I absolutely need this! Any help for organization is great, I frequently lose or forget about things and sometimes that just isn’t good. I love the binder and the stickers!! So cute and it would definitely help this mom of five keep things organized! Very cool contest! I have to write everything down! 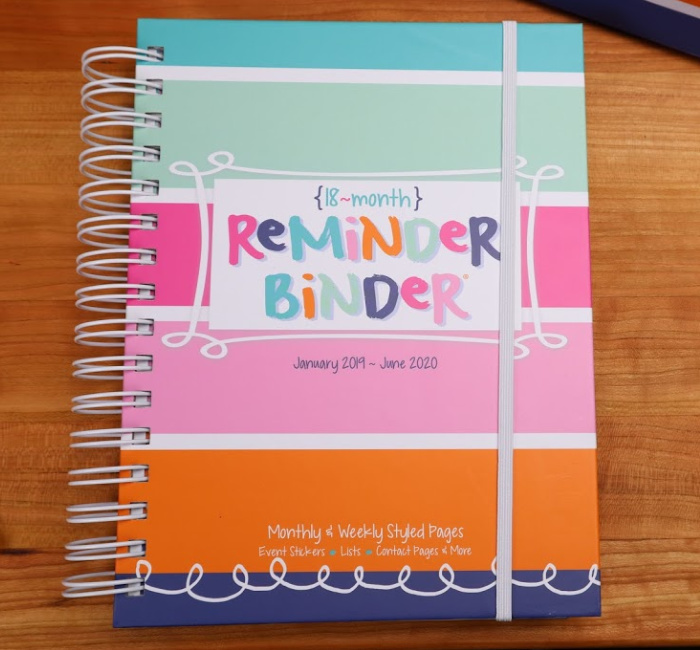 I’d love the NEW 2019-2020 Reminder Binder® Planner! This planner pack is super cute!! Thank you! I am always looking for tips on how to get more organized! I really like this planner package. Very cute design. Im such a sucker for planners/notebooks and this is no exception! I need all the help I can get with getting myself organized! These are cute! I’m not great at organization, but it’s easier when everything is cute. Absolutely wonderful tips and tricks to be & stay organized. You can keep a weekly or monthly calendar. You can make it colorful and inviting for everyone to look at & study. 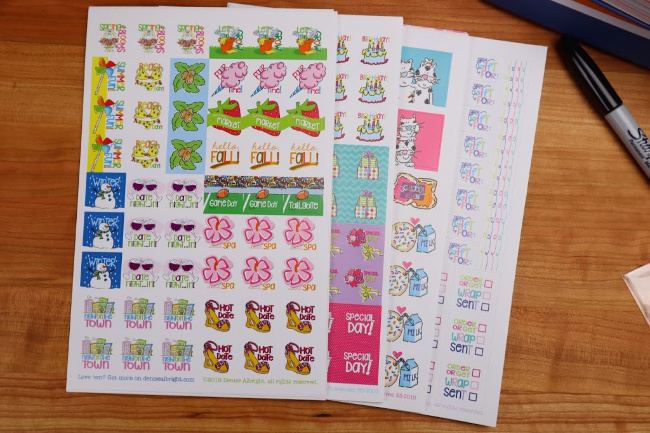 Children love stickers which means the calendar or by name stickers can be added. The planner package is perfect for those that struggle being organized. Thanks for this awesome review. I could really use this. I am always looking for a calendar. This one is a really nice one. Lovely wonderful, and colourful planner. Good to make planning fun. What a great detailed review, I am in love with the Reminder Binder, It would really be a useful tool to help me get organized. It looks actually fun and interesting with this book. 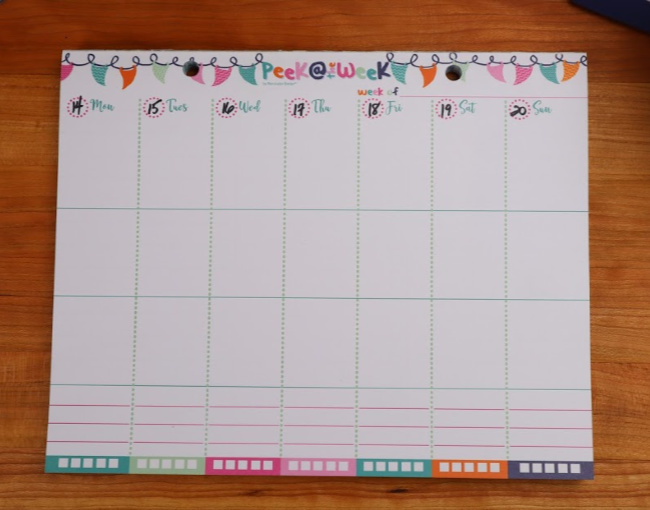 The peek at a week pad is also extremely helpful as well, Sometimes i can only plan and go on a weekly basis and this makes it super easy to do so. I really like this set, I think this is an awesome get organized set to use. Would love to get organized! Oml I need this in my life!!! This definitely looks like such a fun planner, I love how it keeps you engaged and motivated! And who doesn’t love stickers?! I know they make schedules a lot more fun for me to plan. 🙂 Thanks for sharing! This planner looks like it will help me stay organized. These are so pretty! I love the colors! I love to be organized. These look like super great products to keep you super organized . This reminder binder looks great! I can use this to help keep track of appointments. This is cute looking, I don’t have one myself but if I had one it could help me be more organized. I love this planner. It’s so easy to organize your plans and keep up with them. I love you can be ahead of appointments and keep up with your goals, which make them easier to reach. These would make it fun to stay organized! Me too! The stickers are adorable! The Pull and Place Adhesive Strips would be so convenient to have! I like how easy they are to use. I’d love to get the Peek at the Week planner for my son’s family. They would really like it. Franklin sells a dull version of this, sans the stickers. My life is so crazy- I need one of these!! I love the variety of products! They have everything you need to stay organized. Love this organizer, I think its great that you are able to add more or less into this binder. Great way to keep track of all your daily and weekly needs. These are such a fun way of staying organized! This looks awesome and organized. I need to invest in planner. My life can get really busy. These would help a lot! My niece would love this organizer. I like that it has an elastic band to keep it closed. My organizers can get pretty full! This looks like a really nice planner! This would make a great gift for a friend or relative with a busy schedule. This would be great for keeping track of my meetings. I really like the holidays overview. I enjoy doing a little something special for my family on even the smaller holidays and that would help me not to miss one. This is so cute! It makes me wish I were organized. I need help with getting organized! Thank you! Denise Albright Studios really has everything you need to stay organized. That’s so cool! Wonderful way to keep track of appointments and just keep organized. With all our Dr visits and clients i have I could really use one now. My nephew could use this for his meetings. I just love the bright, happy colors of these organizers! They are so eye catching! This would be helpful for me to keep track of my many meetings. I like that the Reminder Binder has a hardcover. It gives it some extra durability. The planner pad looks really nice! My brother would thing this is nice. The Stock it Pocket sounds useful! I tend to collect a lot of coupons, so it would be nice to store some of them there. This looks like a great planner, it looks like everything is covered. For my mon’s medical appointments,this would be great. The Nifty Gifty Checklist sounds great! I’ve sometimes forgotten until the last minute to get a gift for a special occasion. They make so many wonderful organization products. I’m really impressed by the quality and attention to detail! These would be great items for my older sister to have! I just love the variety of organizational products Denise Albright has. You can find anything you need! My nephew would get a joy out of this. I would love to get these for my daughter. She’s always busy and would get a lot of use out of them! this would really help my daughter to get organized. I’m loving the cute, happy colors and fun style of these products! They’re so cool! These are awesome! Looking around on the Denise Albright site, I saw some other fantastic products, like the Class Keeper. My son and daughter-in-law would love to have that for their children. My niece would love to organize her kids playdates with this. This is a great planner! I would love to have one like this. I like that they even have stickers for things like “Spa” and “Fair Time”. They’ve really thought of everything! I love the reminder binder, It is so cute! This is great for my older sister that has a lot of deadlines at work! My Mom would use this to organize her doctors’ visits. I would definitely be carrying the Reminder Binder around with me while I do errands throughout the day. It would be so useful! My brother could use this for his business. I so so so so need this! These products would be so great to have! I could really use some help staying organized. I have an absent minded co-worker that I will share the information about this planner with. I have to admit that I thought this was going to be a short article. I mean how much can one say about a reminder binder? I have to say that this binder is very useful! It’s got everything! I watched the video. Seeing the binder come out and into the box it comes in, reminded of a small desk with the needed supplies in it. My granddaughter loves to journal and keep reminding books. She really relies on it now to plan her wedding in October. Thank you for the in-depth article! This looks like a wonderful planner a way to be really organized! I’m so impressed with all this brand has to offer. They have really detailed organizational tools and their products look so trendy! Definitely could use this to keep my hectic military life with 3 young boys on schedule! I really like this. ive been using a planner as a baby book/ scrapbook for a few years now, its definitely the way to go! they are so versatile and easy to accommodate your needs no mater how you intend to use it. My brother-in-law could use this for his business trips. I’m probably the most disorganized person I know. This looks like a great product and I think would have been a godsend when my girls were younger and we were dealing with school and activities.